Microdermabrasion is an ultra-advanced facial scrub and is used to soften the appearance of acne scarring and other surface irregularities, leaving a polished and smooth surface. Microdermabrasion has the advantage of no downtime and the results are remarkable. Microdermabrasion also makes the skin more receptive to massage. A natural moisturiser is applied to the skin with acupressure massagers. Using light pressure with the massagers the skins natural production of vitamins and collagen is stimulated, renewing elasticity to the epidermis. Microdermabrasion and acupressure massage create a feeling of wellbeing, revitalising the skin as naturally as possible for a healthier complexion. Microdermabrasion – the treatments the celebs can’t live without! 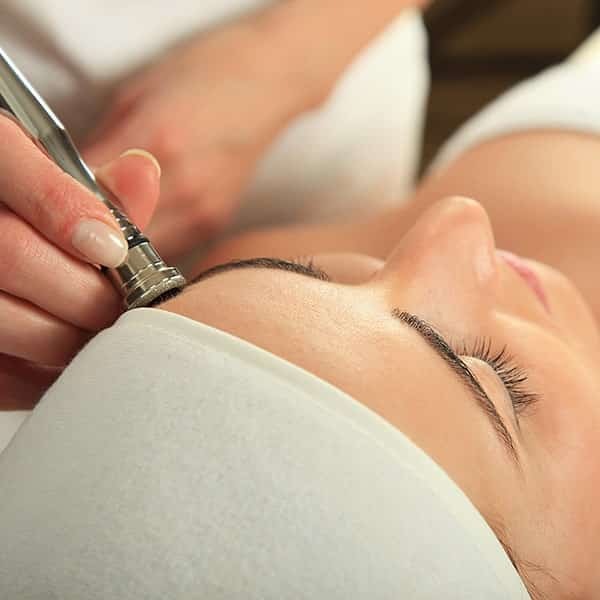 Micro Dermabrasion removes the top layers of dead and dormant cells from the facial area. Microdermabrasion is a non-surgical, non-invasive treatment that uses a specialised diamond head on the skin. Microdermabrasion is basically an ultra-advanced facial scrub and is used to soften the appearance of acne scarring and other surface irregularities, leaving a polished, smooth surface. Microdermabrasion has the advantage of no downtime and the results are remarkable. Microdermabrasion is performed by using specialised rotating diamond hand piece, across the skins’ surface to remove the dead and damaged cells. The therapist can control the depth of the abrasion. Treatments are usually performed in 45 minutes and your therapist can recommend how many would be of most benefit to you. After the treatment the skin may feel tight as if exposed to the sun or wind. Some skins may peel and it is important to use good moisturisers as advised by the therapist. If deeper treatment is performed, there may be marked redness and swelling which will subside within a few days. Healing time varies from 3 to 4 days or longer, but the results are worthwhile. One session costs £53 but the number of treatments required depends on the individual. We also offer a course of six treatments for optimum results. Cameron Diaz, Kate Moss, Posh – for celebs, it’s a must-have as is the latest Louis Vuitton bag! Because it gives visible, lasting results with zero recovery time. It works wonders on acne scars, pigmentation and fine lines – plus it’s great for the squeamish as there are no needles or knives involved. We also offer an Advanced Microdermabrasion treatment and details can be found here.